Condition Note: includes bonus Kickstarter Exclusive Ship and Egg tokens! 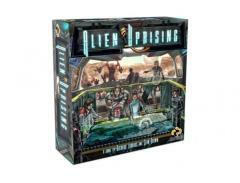 Alien Uprising is a cooperative game in which players will direct 3 - 5 crewmen of a crashed Lennox-Class star ship through a desperate battle with the enraged Zothrens. The goal of the Crew is to either hold off the Zothren attacks until either the rescue ship arrives, or repair the ship and lift off of the hostile planet before being overrun. To achieve either of these goals, the crew must work together, using their unique skills and chosen actions to perform a number of tasks, defend themselves, and to retrieve and repair equipment as well as the Ship. The actions available each turn will be established by the First Player rolling custom dice.